They say that life is full of choices. Chicken Joy or Chicken Mcdo? Red or white wine? Stephen Curry or LeBron James? Nora or Vilma? Same dilemma applies when you’re buying a vehicle. Would you opt to get a brand new model or a used car? This question becomes trickier when you have to work within a certain budget. 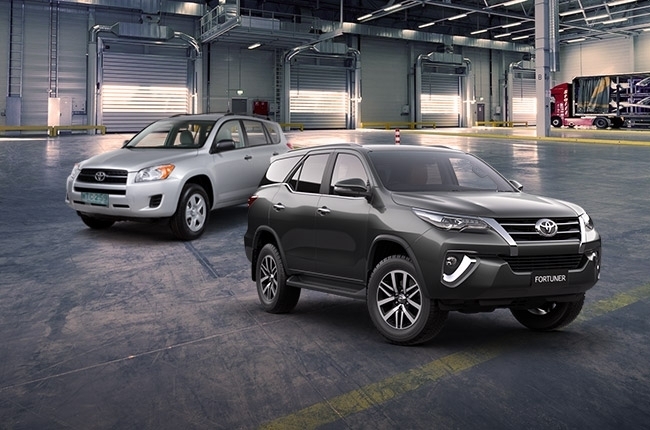 Let’s say you have P500,000 and been wanting to get yourself a car, which would you prefer? 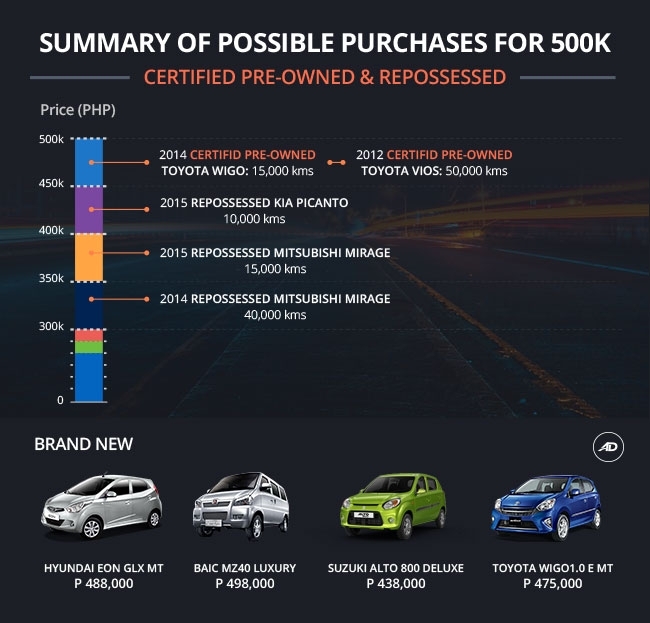 In order to help you reach a decision, we went through our data to find out the possible brand new and used cars that have a price tag of less than P500K. However, before we get into that, you have to take note that each has its own pros and cons. Brand new cars have a fresher look inside and out (obviously), which gives you extra style points. It also comes with a warranty and a new car scent. However, brand new cars are more expensive as compared to used and it depreciates in value the moment you drive it out of the showroom. It also has higher insurance tax and fees, which adds up to its overall cost. On the other hand, used cars have a more modest price tag and lower insurance rates due to the vehicle’s depreciated value. But you have to be keen if you choose to buy a secondhand car. Beware of its hidden flaws as these could lead to high maintenance cost. Aside from the model year of a certain vehicle, mileage plays a huge role in determining the value of a car. 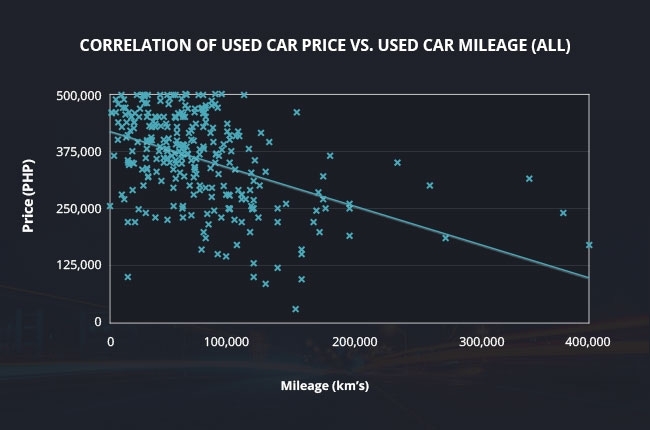 This graph shows how mileage dictates the price of a used car. As it increases, the price of the car decreases. Going back to the real issue at hand, what are the possible brand new and/or used cars you could get if you have a P500,000 budget? Here’s a graph to help you. 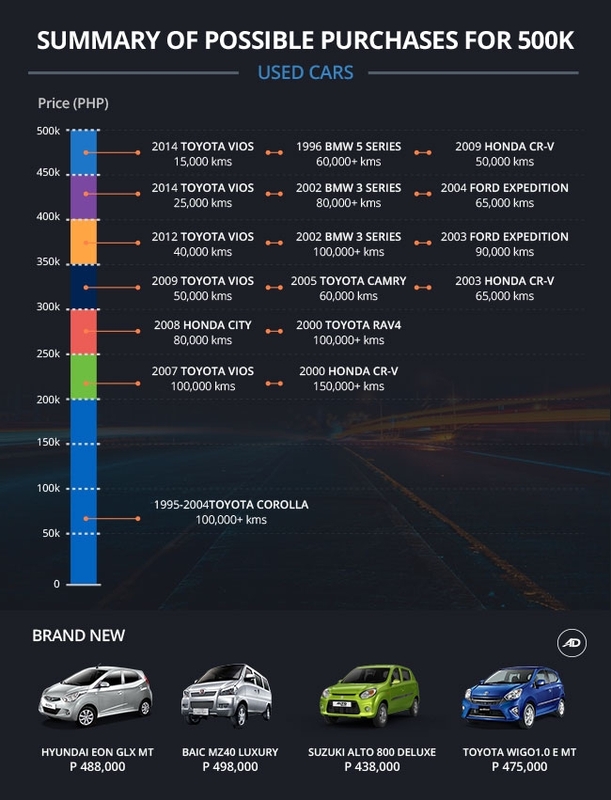 Take note that the used cars listed on the graph are taken from AutoDeal’s listing, available by the time the article was posted. 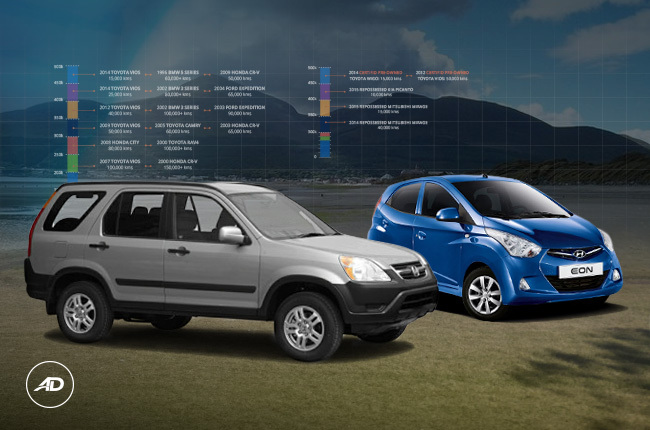 The graph simply plots out the possible cars you can buy for P500K. Brand new cars that fall within the said price are mostly subcompact hatchbacks such as the Hyundai Eon, Suzuki Alto, and Toyota Wigo. If those cars don’t suit your taste, you can go for the BAIC MZ40. For the uninitiated, the BAIC MZ40 is a minivan that could accommodate up to 7 occupants. Used cars, which include certified pre-owned and repossessed vehicles, give you a wider selection considering the P500K budget. For less than P100K, you can already drive home a 1995 Toyota Corolla. The graph also gives you an idea of the possible used cars that you can buy for the same price range. You can either get a 2004 Ford Expedition, a 2002 BMW 3 Series, a 2014 Toyota Vios, or a repossessed 2015 Kia Picanto. Overall, there are a number of brand new and used cars you can buy with P500,000, but before making your decision you need to know where and how you will use it. Be practical and consider all your options before you make a purchase. So, will it be brand new or used? Stephen Curry or Lebron James? Choices.